Eve Records step up to the mark again with another uplifting trance tune that fits firmly in the mould of the imprint. 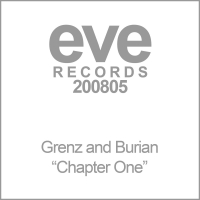 Blissfull melodies, deep and driving basslines and a very clever production style makes Eve a perfect platform to showcase Grenz and Burian's latest creation. Project Logical are on remix duty here who were previously "Star Industry" (aka Anguilla Project) (eve200802)) untill we found out that some mangy goth metal band existed with the same name! Fortunately they deliver with equal panache under the new name. This release will be available as digital download and CDr single. 'Chapter One' is available now from Beatport and iTunes.